Thursday was… a day of cold, wind, clouds, sun, adventure, challenge, and fun! Eldorado Canyon State Park is simply a maze of quality challenging climbs – leaving you tired, satisfied, and ready for more – especially with an experienced guide, Steve Johnson. Meeting at the parking lot at the beginning of Eldo’s tall canyon walls, we readied our gear. The location of this area is perfect – just outside of Boulder Colorado. Steep climbable cliffs line the edge of rushing South Boulder Creek. After a 30 minute uphill trudge we reach the base of the Rewritten. Wind, cold, and clouds had us wearing every piece of clothing we had, but by the time Steve led the first pitch the sun came sweetly flooding our little rock world! Shedding two layers, I began climbing the first pitch of this classic. There was almost every type of climbing movement on this great route; face, crack, lie-back, chimney, roof, inset. But the best and most exciting was that the sharp, exposed arête near the top of pitch 4(?). Stepping out into space with winds gusting 40 – 50 mph took all my courage! All the while, Steve calling out encouragement, “you CAN do this!” And then the step across the void onto another face from the arête was definitely the “move of the day.” Steve drew out of me the willingness to trust how he told me exactly where to place my feet as I stemmed out across this scary void! We topped out but the adventure wasn’t quite over. The decent required careful route finding and down climbing some steep 4th class terrain. Steve led the way safely and kept the rope on me until we were back on the main trail. 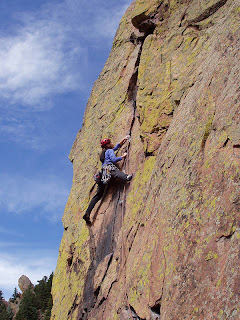 -Colorado Mountain School Client, Mary M.
If you would like to get out and climb a route like this one, or any other routes in Eldorado Canyon, let us know. We can guide there any day of the week. I’m typically sort of a nerdy guy, fascinated with books, gadgetry, gizmos, numbers and all other things socially awkward. I even talk nasally, have freckles, wear thick glasses and routinely go for days without showering. So when I got my hands on BCA’s new Tracker2 avalanche beacon last year, you can just imagine my unclean snort-giggling fits of glee. Now, this beacon isn’t brand new to the market but I’m sold on it despite a number of other cool beacons out there. Despite my nerdicular tendencies, I appreciate the simple and efficient design of the T2 beacon. Boasting an additional antennae and faster micro-processor than it’s predecessor, this beacon already out-performs others on the market, including the original Tracker. Ah, but those boys at BCA think of everything, even super-cooling the antennae before building their beacons so that really cold days won’t damage the frequency we so vitally rely on. Cold temps can adversely affect the antennae, causing frequency drift but BCA cools them first, then aligns the frequency. It’s just one less thing to worry about when you forget the beacon in the car overnight as you rush indoors to catch another rerun of Family Matters. My favorite feature of the T2 is how quickly it can switch functions, from transmit to search and vice versa. Other beacons have a prolonged start-up time and, in a stressful situation, these 6-15 seconds seem like hours. With the T2, you can turn it on, immediately pull the search “tab” and begin your signal search, all in less than two seconds. The super fast micro-processor gives real-time information as you search and the third antennae effectively eliminates “dead zones” in your fine search phase. Priceless. As unlikely as multiple-burial scenarios may be, my favorite T2 feature comes in handy when searching for multiple victims. Let’s say you’ve pinpointed one victim and are looking for a second. Your searching beacon will “lock on” to the buried beacon you’ve just found and will prefer that signal even though you move away, something called signal loyalty. With the T2, it’s easy to “reset” your searching beacon simply by pushing in the search tab and immediately pulling it back out. If nothing else, this at least clears the “memory” which might allow you to focus in on the closer, stronger signal. This is just a little shortcut/tip that has helped me find three beacons in a football field of snow in less than two minutes. Dorking out for a few minutes and mastering the ins and outs of “special mode” will also make you an asset in any multiple-burial scenarios. 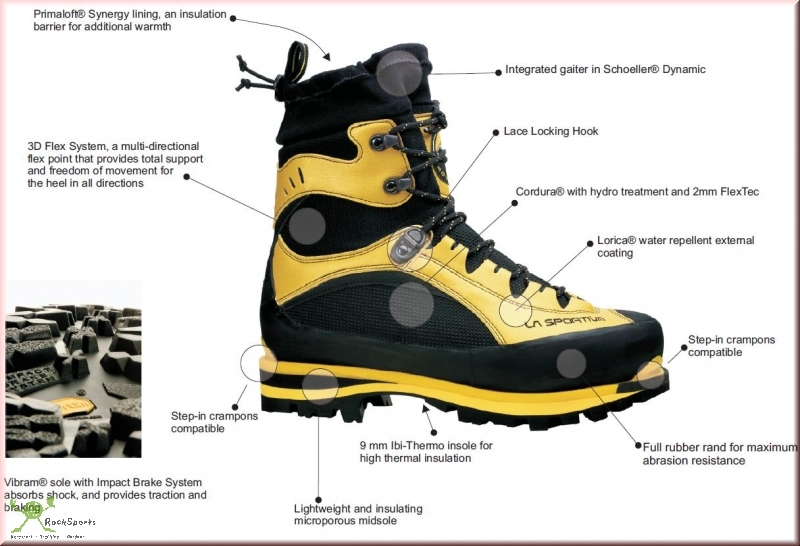 These are just some of the features and one little trick that make the Tracker2 stand out above the rest. If you’re interested in honing your companion rescue skills, just tape up your glasses, tighten those suspenders and come on over to CMS for a day of knee-slapping nerdery. I’d love to show you what I know and, chances are, I’ll have recently showered. 🙂 Here’s to a great, safe winter! Well, the snow is flying, the ice is forming and the sweet days of 60 degrees and sunny are still happening in the Front Range. Two days ago I climbed in Eldo, yesterday I skied and today I’m climbing in Eldo again. 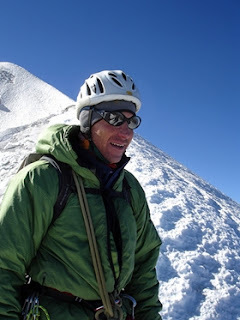 Friday I’ll be climbing in Boulder Canyon, we have ski guide training coming up and our first avalanche course of the season is just around the corner. Life is good. But what of the purple and green routes you ask? Well gym climbing season is also kicking into high gear. Each Thursday I take a break from the elements and get into the Boulder Rock Club for some serious plastic pulling with regular clients Tom Stocker and Becky Browning. 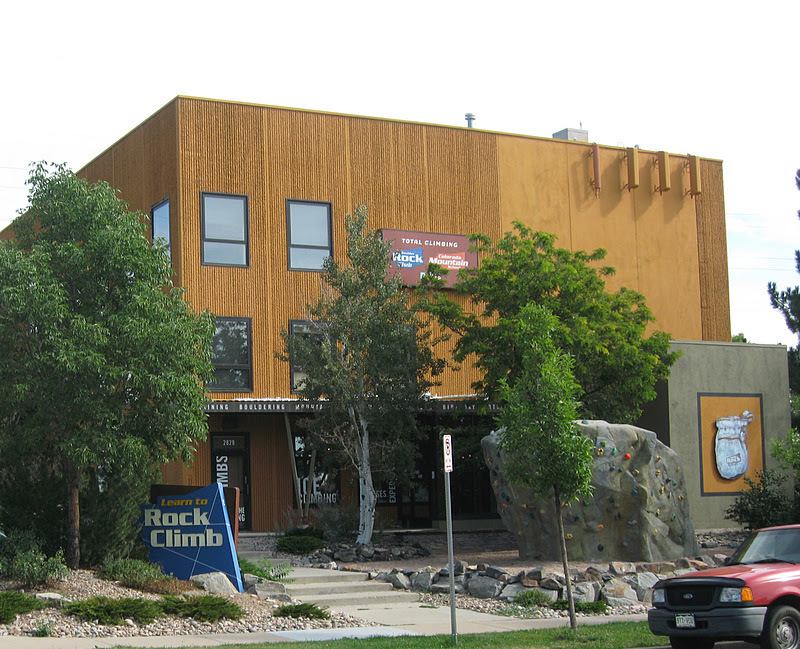 Just like last winter, we will spend from now until the snow is gone training for next year’s main rock climbing season. Working on technique, strength, endurance and strategy we also have a great time for a couple of hours out of our busy week. This week Tom’s son Thad also joined us. Slopers and steeps were the main focus this week with progress made by all. 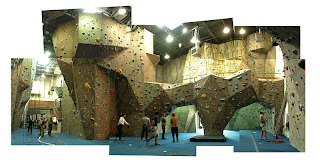 We worked slopers in the bouldering area and the steep moves on full length routes focusing on body position to increase reach while decreasing arm fatigue. Although I have to admit, we also worked a bit on overhanging sloper problems! Training in the gym can be a great way to hit the ground running (I mean hit the rock sending!) in the spring. I still have a free hour or two on Thursday afternoons, care to join me? The Black Canyon is home to some of the longest and best rock climbs in the state of Colorado. It is a place that has an intimidating and dark reputation. Horror stories of bad rock, dicey runouts, and getting benighted can be heard whenever the The Black is mentioned. Think of Yosemite’s bad ugly brother that lives in the attic and you’ll get the picture of this brooding canyon. Despite The Black’s fearsome reputation, the classic routes are as good as you will find anywhere and can be a great place to hone your skills for bigger alpine rock objectives in the greater ranges. 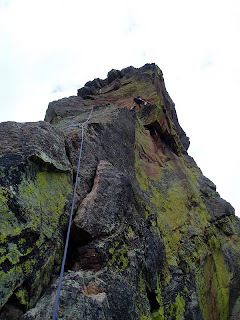 One of my personal favorites, not just in The Black, but anywhere is the ultra-classic “Scenic Cruise.” It’s a 15 pitch (by the guidebook) mostly crack climb straight up the southwest face of the North Chasm View wall. 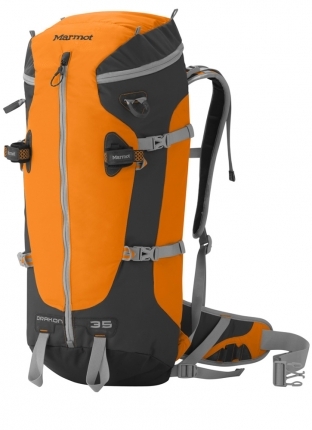 It has everything a climber wants: great climbing, aesthetic quality, good rock, and you top out at the beer cooler. Your first time on a route of this magnitude can be intimidating physically, mentally, and logistically. I hope to dispel some rumors and give some hopefully helpful beta on how to climb The Scenic in a timely, expedient manner. 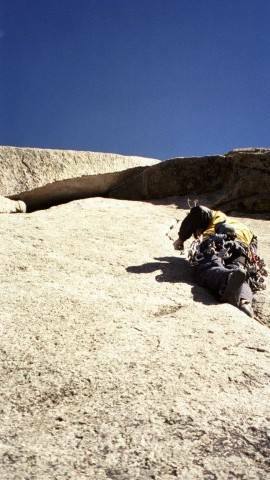 If you are a solid 5.10 trad leader climbing this route in 8 hours should be totally attainable. 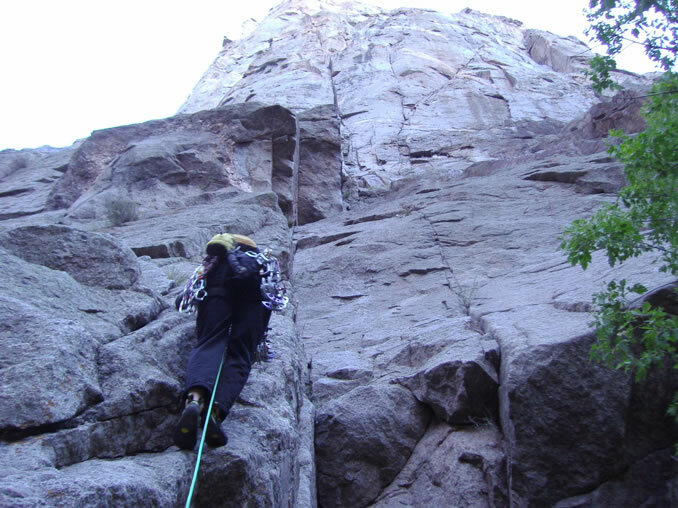 Before you go, make sure you and your partner are fast with belay transitions and have good route finding skills. 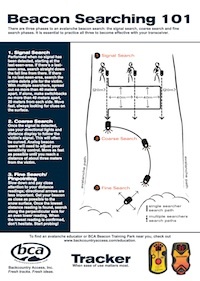 Do your homework: Research the climb beforehand. Read guidebooks, online trip reports, talk to friends, and look at any beta photos you can. Become as familiar with the terrain as you can. Plan ahead: Scout the Cruise Gully entrance the day before so you don’t get lost in the morning. 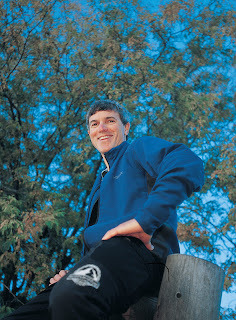 Each climber should have a copy of the topo with them on the climb. Figure out who is leading what pitch before you go. Know that retreat would be difficult and expensive. So here it is, the how to. Don’t forget to sign the board at the Ranger Station. Depending on the time of year (May and October are best) hiking by 6am is usually the best. It will be cold in the morning but you will be basking in sun hanging from perfect hand jams by the time you make it to pitch 3. 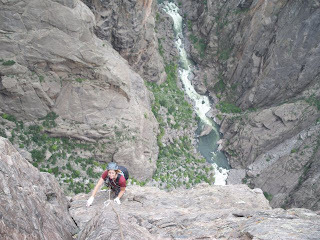 The Black Canyon mantra of “A rope, a rack, and the shirt on your back” certainly holds true. Light is right. 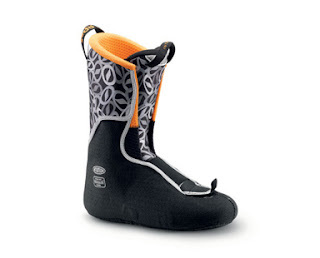 Hike down the Cruise Gully in your climbing shoes. 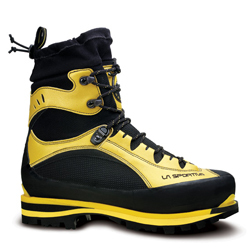 It’s not far to the base of the route and then you won’t have to carry extra shoes on the climb. The rappels in the gully are usually fixed by early May. Check with the Rangers before you go. If you are there in the spring, there’s usually a forest of poison ivy at the base. It can be avoided. Be careful or wear a Tyvek suit if you are allergic. Scout the upper pitches from the base and look to make sure you know where the Scenic goes left and the Cruise goes right. It should be obvious from the base. P1- 5.8 Climb the 5.7 arete then into the slippery groove up through some easy but funky terrain and through the 5.8 hands section to a good stance. There are a number of old rappel anchors in this section. You will be simul-climbing a short ways with your partner. You just linked the first 3 guidebook pitches. P2- 5.9 Traverse left from the belay into a slightly loose blocky crack system. The climbing is steep and fun. Continue up the corner to a small stance below a shallow right facing corner. P3- 5.10 Climb the thin corner off the belay (its harder than it looks) to a small stance with a perfect hand crack above you. Fire up the hands passing a small overlap and finishing in some funky peg. P4- 5.10- “The Peg Traverse.” Not as bad as its reputation. The runouts are on easier terrain and the rock is mostly solid. 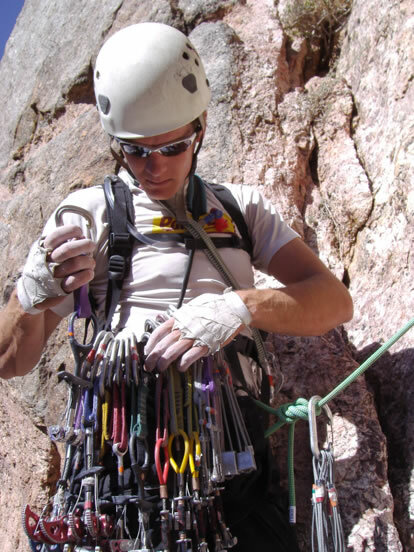 Climb up off the belay, clip the fixed nut (there is usually some long slings on it). Start climbing down where you can eventually place a .5 camalot that protects stepping around onto the ramp. You can then back clean the piece to protect your partner. 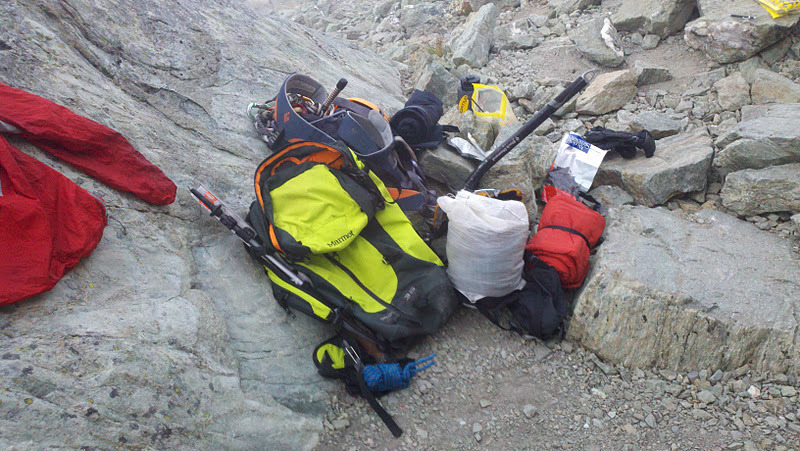 Continue up the ramp to a horn belay with fixed slings. *When your partner arrives at the belay, have him/her continue to the ledge below the crux pitch and build an anchor. It’s a short pitch and keeps momentum going rather than swapping gear/leads. P5- 5.10+ Climb the overhanging corner. It’s steep and sustained but has good holds. Look for the occasional stem rest and fixed wire. Exit the roof to the right and catch your breath, then fire up the 5.8 hands and straight into the 5.8 offwidth slot. Save a big cam for the slot. Belay on a great ledge off mid sized cams. P6- 5.8 Climb the blocky crack system on the left. Some steep climbing leads to easier rambling up and left. 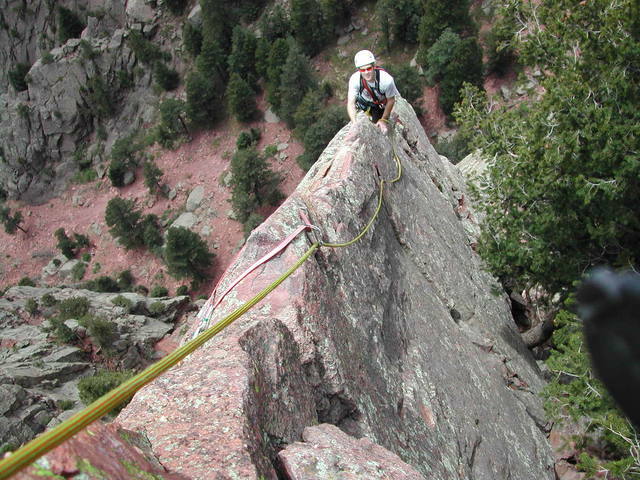 Belay below the big flake off of .5 and .4 camalots. P7- 5.7 Continue up to the flake and chimney behind it. Climb up and right to some funky flakes and a good ledge with a bolted belay. P8- 5.9+ Traverse right off the belay into some flakey rock. Continue up and right into peg while passing 2 bolts and an old bolt missing a hanger (a little runout). There is still an exposed stud. Fire through on some sloping holds to a short corner and small ledge. Punch up the short but difficult layback into easier terrain. Belay at the good ledge above. P9- 5.9 Traverse left from the belay on flakes into a right facing corner. Continue up the sustained crack passing an old fixed cam. 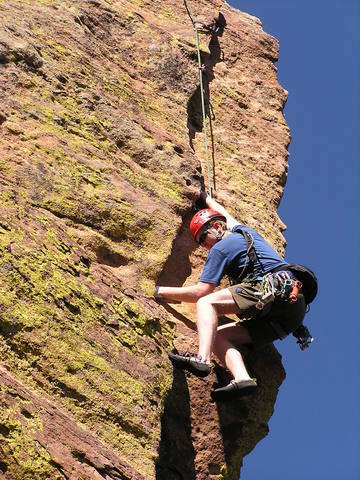 Keep climbing on slightly easier ground until you get to a small but good belay stance. Belay here or continue to the terrace. Once at the terrace, you can unrope and walk the easy (3rd class) exposed terrace or do some roped traversing pitches. Follow the path of least resistance and look for a blocky chimney exit to the rim. The last short section should be 4th class and is easily soloed. High five your partner and be psyched you just did one of the most classic rock climbs in the nation! 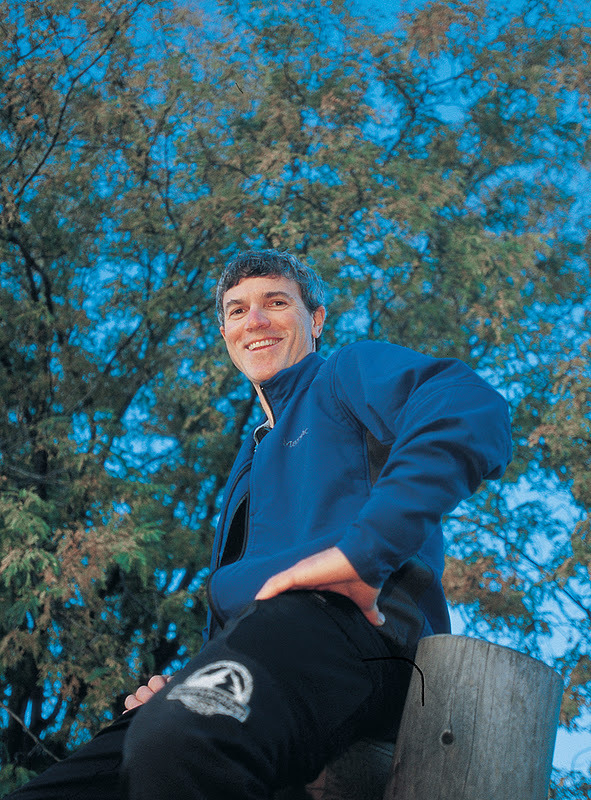 An average time for a river to rim ascent by a competent team should be around the 8 or 9 hour mark without any major route finding errors. The Scenic is great spring preparation for those people looking to climb a summer route on the Diamond such as The Casual Route or Pervertical Sanctuary. While the Diamond routes aren’t as long they require speed and efficiency to beat the afternoon thunderstorms. It’s also the “entrance exam” to the other bigger routes in The Black such as the Southern Arete on the Painted Wall or the Flakes on the South Rim. 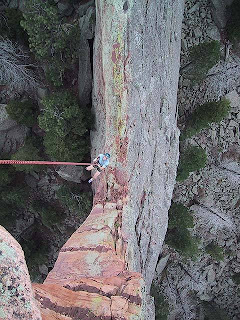 Oh yeah… I forgot to mention… Earl Wiggins free soloed the second ascent of the Scenic Cruise in 2 hours wearing Kronhaufers and no chalk bag! I hope you can enjoy this route as much as I have. We’re still digging out from Winter Storm #2 and storms #3 and #4 are already in the forecast! 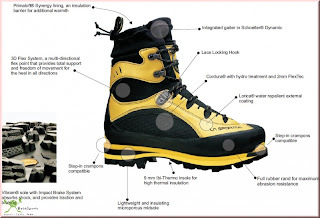 As the snow pack builds over the next month or so, this is the perfect time to also be building your backcountry skiing fitness base. A complete ski conditioning program should include elements of aerobic and anaerobic fitness, plyometric resistance, and strength training. The aerobic conditioning will get you up the skin track; the anaerobic conditioning will enable you to link turns for hundreds of vertical at a time; the plyometric resistance training will prepare your body for dynamic skiing movements in ever changing snow conditions; and the strength training will build overall power and will help to prevent injury. CMS Guide Matt Lipscomb hits the weights to prepare for ski season. One of the most efficient styles of strength training is Olympic weight lifting. The Olympic lifts are dynamic, they engage multiple large muscle groups, and the strength gains translate well to athletic sports (like backcountry skiing) without “bulking up.” Shown above is one of my favorite training lifts – the deadlift. It works all the major muscle groups in the lower body (hamstrings, quads, glutes) as well as the core and lower back muscles. 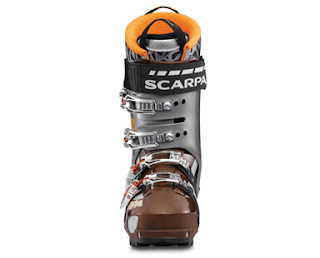 Now is the time to build your fitness foundation for a long and rewarding ski season! 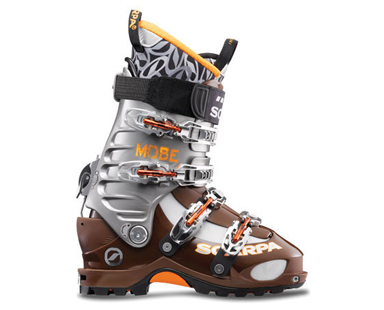 Once you are ready to get out skiing, I’d love to be your guide. Call the office, request me, and let’s get some turns in together. 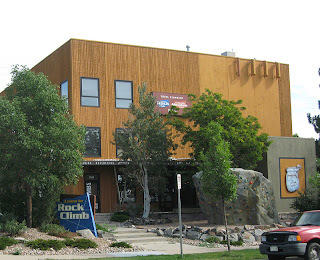 Please Note: The Boulder Rock Club offers ski conditioning classes free for all members. Tuesdays at 5:45pm and Wednesdays at 12pm. As the summer time rolls out and the winter time rolls in I begin to reflect on the all the great climbs I did over this last climbing season. 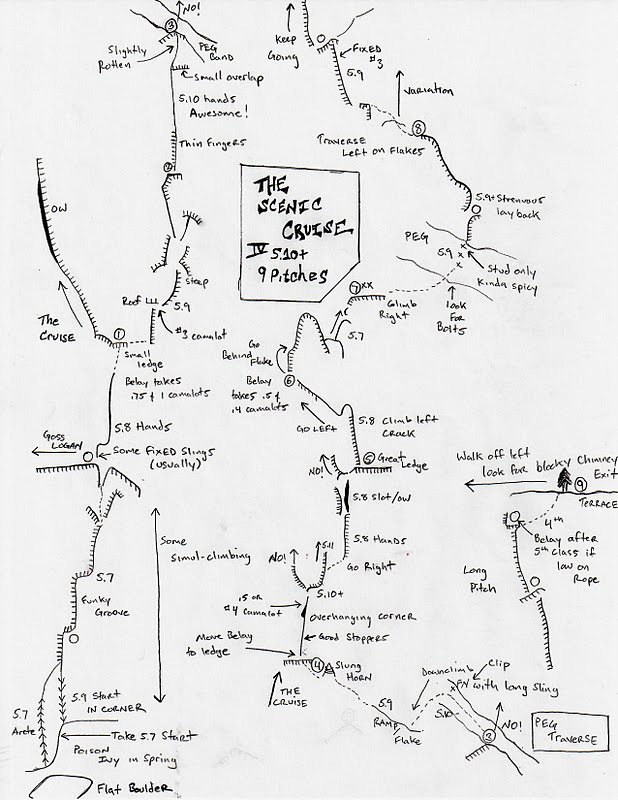 I climbed quite a few routes this spring, summer, and fall and there are a few that really stick out in my mind. The first route that sticks out in my mind is the East Ridge of the Maiden. My friend and I did this route this spring. Many formations in this area are closed due to falcon nesting. It may be because of this, but we were the only ones on the formation that weekend. The guide book says it is 5 pitches. We strung together pitches 1 and 2 as well as 3 and 4. We were climbing with a 70m rope, which made it nice. Pitch one is a beautiful crack and pitch three involves some wild face moves. After topping out two single rope rappels bring you back to the ground. The first rappel involves a free hanging rap down to the “crow’s nest”. The second rap is down the south face. A quick scramble back to the base brings you back to your packs and the trail to head out. The second route that sticks out in my mind is Fat City (5.10c) at Lumpy Ridge. This route is on the Book formation. Although the hike up to the Book can be a bit of a hump, this route is well worth it. Plus when you add in the route Cheap Date, this is a route that shouldn’t be missed, and that is what we did. When I first moved to Colorado, this is the route that I took my first trad lead fall on. That fall happened on the first pitch and I couldn’t even get through the second pitch. This time, 5 years later, I made it through the first pitch without any problems. 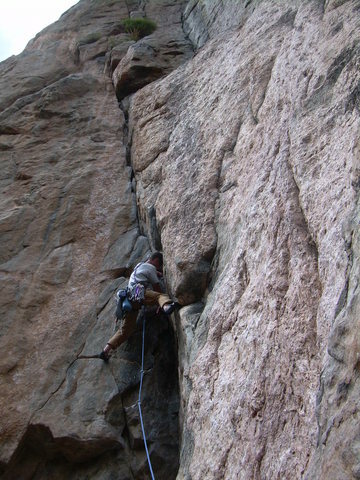 The second pitch is the crux. Thin fingers lead to a bit of a chimney, followed by and overhang. Really work the feet for the finger sections and you’ll do fine. For the chimney section make sure you rack your gear on the right side of your body. For the overhang I threw my right hand up with a thumbs down jam and tossed my hip over the lip and kind of scummed it on the wall. The third pitch has a bunch of great lie-backing. It is a fairly long pitch and will bring you to the cave. From there you can finish up on Cheap Date or do other various exit routes. Once you top out, hug the wall to your right and you’ll end up back at the base of the formation. 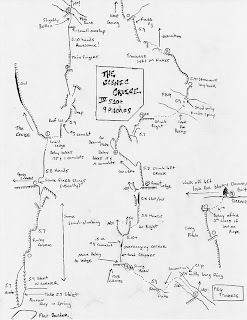 This route has a little bit of everything, and because of that I recommend you put this route on your to-do list. 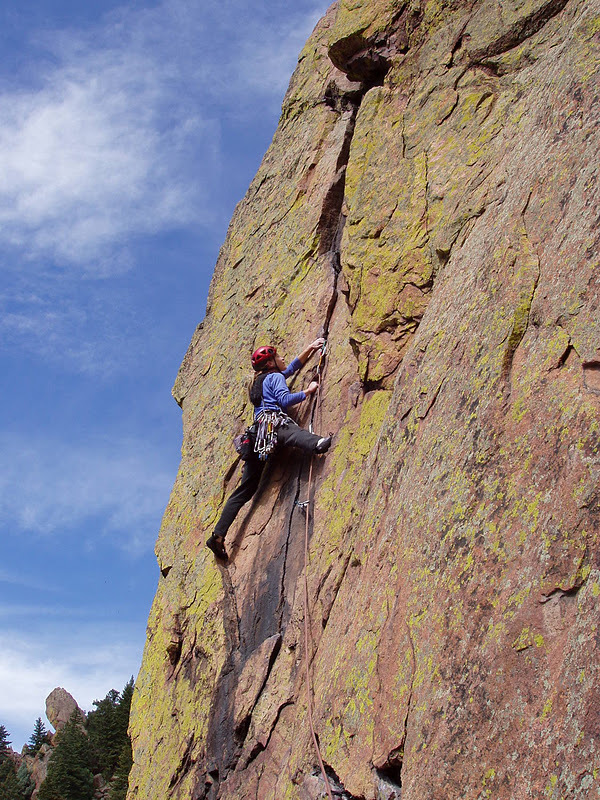 The third route that sticks out in my mind is Rewritten (5.7) in Eldorado Canyon. This route is situated high up on the Redgarden Wall. My climbing partner and I started the route with the first pitch of the Great Zot (5.8). By doing this, you get to climb a great crack through a little bulge. Really fun. After two more pitches of fairly easy climbing, you come to another amazing pitch. A traverse out left brings you to an airy and exposed hand crack. After this pitch you get another amazing pitch up a knife blade arête. From the top of the arête one more final pitch brings you to the top. Overall, these six pitches are amazing. A walk off brings you back to your packs. There are many more routes that where a blast. For whatever reason these routes just stick out in my mind. I recommend everyone doing them. If you don’t feel comfortable leading them, the guides at the Colorado Mountain School can guide you up anyone of these routes.